What a fantastic class! roseambr, my niece Gen and I spent the morning learning to make chocolates at Oregon Culinary Institute with instructor and all around great chef str8ontilmornin. First, Chef str8ontilmornin talked about chocolate origins and the different melt and tempering temperatures of various kinds of chocolate. 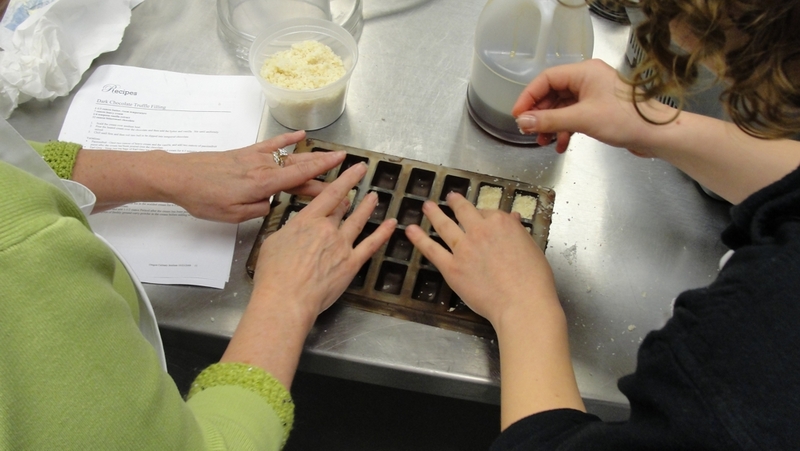 Then he demonstrated tempering, and making ganache, and caramel, and white chocolate (which he confirmed is not chocolate at all), and how to use molds. Then he let us loose in the commercial training kitchen for three hours. Caramel-filled floral cube, almond-pistachio bark, caramel filled heart, dark chocolate-Grand Marnier truffle, caramel-filled gems, coconut filled, broken ganache-filled gem with sea salt, and milk chocolate truffle-filled fleurs-de-lys. Chef str8ontilmornin is an easygoing, good-humored teacher with a tremendous knowledge of the subject and loads of patience. And graduate students who did all the dishwashing for us. It was awesome. 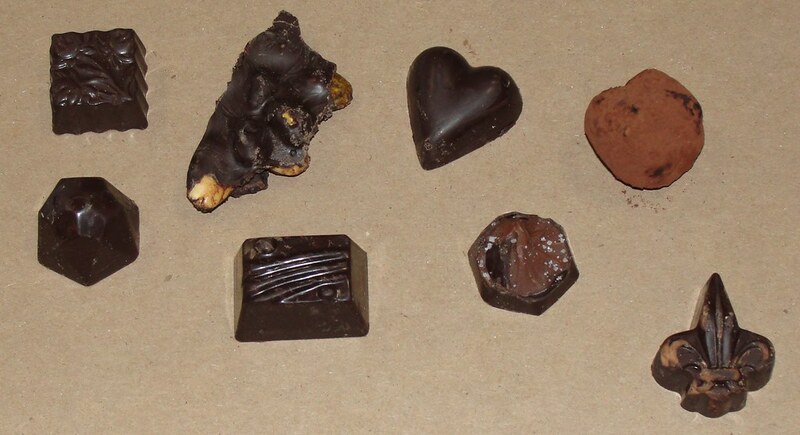 Everything tasted delicious, even though our technique left quite a few boo-boo looking chocolates. My personal fave was the nut bark--the nuts are dipped in simple syrup, then roasted in the oven for a while, then we added sea salt, then stirred them into the chocolate. Fantastic. Oooooh, that sounds like my kind of chocolate treat.